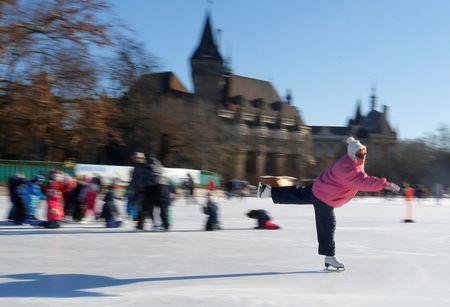 BUDAPEST (Reuters) - In sub-zero temperatures, dozens of elderly Hungarians take to Budapest's beautiful City Park Ice Rink on their skates each morning to keep hale and hearty through ice dancing. 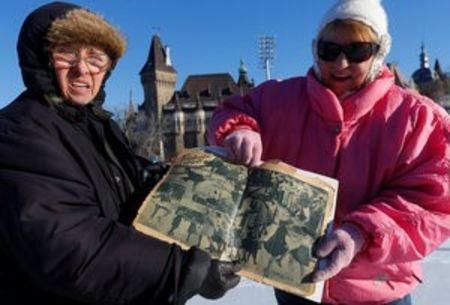 The history of the ice dancers' group dates back to the 1950s. It includes former professionals as well as enthusiastic amateurs now. The ice rink is the largest and the second oldest of its kind in Europe. "This keeps me in good shape ... as it moves every muscle," said Mara Patai, 70, with a big smile. She started professional figure skating as a child but gave it up as her ankle was too weak, only to pick it up 50 years later when she retired. Her ice skating partner is Laszlo Gombos, 70, who started ice dancing after he recovered from prostate cancer. "To get over this, I thought I could perhaps switch off this way ... as this is what I really love doing, so I decided to do ice dancing," he said. In each of the past 17 years he learned a new dance, and he says with his partner he goes to another, covered ice rink twice a week even in the summer. All of the dancers say ice skating is their life now, as it keeps them both physically and mentally fit, improves their balance and keeps them in good company. "One can express feelings via the beautiful moves and music, this is magical ... and of course the applause I still get," says Judit Bartfai, 73, who used to be a ballet dancer and a professional ice dancer in the Hungarian ice revue from 1959 until 1981.